A lot of things were going through my mind after stumbling from the room following my heady headphone exposure to Busdriver & Radioinactive with Daedelus' The Weather. "Here is a record," I said, "that is, to use the popular jargon, fucked . . . up." A winter/spring wonderland of some of the most hilariously inspired and sampletastic soundscapes and ferociously facile word-spew (kinda cuddly, though) this pop-culture-bombarded hack has ever had the pleasure of caving in under the weight of, The Weather (on Mush Records) is also, strictly modern-art speaking, a rigorously crafted work of feeling about these nonsensical times in which we're living. Very L.A., somehow, and very--well, deep down it's got some roots in hip-hop, but all that gets obliterated in something more like a joyous musical antidote to any clearheaded thought about anything at all, which is a perfectly logical sound for a culture now in the process of complete core meltdown. The Weather boasts the mind-bending and artful work of one extraordinarily fresh sound-compiler/composer called Daedelus, a.k.a Alfred Hawkins. It's a beauteous bounty of off-the-hook beats-point-zero-two and vast sampled helpings from every '60s-'70s TV commercial or kiddie show you ever wrecked your mind to, lovingly layered, then warped and spray-painted in fiery, fuchsia orgasmic orchestrations. The album thickens the plot with two extremely weird, free-associating MCs often called upon to triple-speed their rhyme flow to keep up with Daedelus' intuitive human-body rhythms. The MCs are the bucolic Radioinactive and a sardonic AM-radio-DJ-voiced guy named Busdriver. The Weather has, for all its jokey verbiage and million abstruse pop-vulture musical obscurities, a way of making political comment in the form of extreme sarcasm, like at its heart is even a kind of rage (not impotent) that says to beat your enemy is to make him feel totally ridiculous. And what the music comes down to is a kind of jazz of offbeats and implied times - free music, in other words, freestyle for freedom-loving listeners. Anyway, knowing all that naturally made me want to know a little more about the people that created such glorious stink. 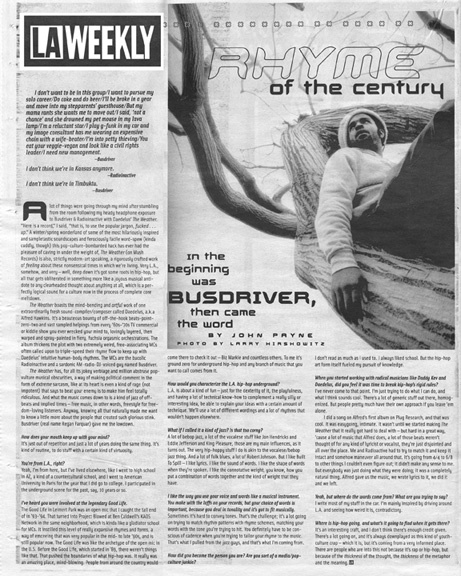 Busdriver (real name Regan Farquar) gave me the lowdown. How does your mouth keep up with your mind? It's just out of repetition and just a lot of years doing the same thing. It's kind of routine, to do stuff with a certain kind of virtuosity. Yeah, I'm from here, but I've lived elsewhere, like I went to high school in AZ, a kind of a countercultural school, and I went to American University in Paris for the year that I did go to college. I participated in the underground scene for the past, say, 10 years or so. I've heard you were involved at the legendary Good Life. The Good Life in Leimert Park was an open mic that I caught the tail end of in '93-'94. That turned into Project Blowed at Ben Caldwell's KAOS Network in the same neighborhood, which is kinda like a gladiator school for MCs. It instilled this level of really expansive rhymes and forms, a way of emceeing that was very popular in the mid- to late '90s, and is still popular now. The Good Life was like the archetype of the open mic in the U.S. Before the Good Life, which started in '89, there weren't things like that. That pushed the boundaries of what hip-hop was. It really was an amazing place, mind-blowing. People from around the country would come there to check it out - Biz Markie and countless others. To me it's ground zero for underground hip-hop and any branch of music that you want to call comes from it. How would you characterize the L.A. hip-hop underground? L.A. is about a kind of fun - just for the dexterity of it, the playfulness, and having a lot of technical know-how to complement a really silly or interesting idea, be able to explain your ideas with a certain amount of technique. We'll use a lot of different wordings and a lot of rhythms that wouldn't happen elsewhere. What if I called it a kind of jazz? Is that too corny? A lot of bebop jazz, a lot of the vocalese stuff like Jon Hendricks and Eddie Jefferson and King Pleasure, those are my main influences, as it turns out. The very hip-hoppy stuff I do is akin to the vocalese/bebop jazz thing. And a lot of folk blues, a lot of Robert Johnson. But I like Built To Spill - I like lyrics. I like the sound of words. I like the shape of words when they're spoken. I like the connotative weight, you know, how you put a combination of words together and the kind of weight that they have. I like the way you use your voice and words like a musical instrument. You make with the laffs on your records, but your choice of words is important, because you deal in tonality and it's got to fit musically. Sometimes it's hard to convey tones. That's the challenge; it's a lot going on trying to match rhythm patterns with rhyme schemes, matching your words with the tone you're trying to hit. You definitely have to be conscious of cadence when you're trying to tailor your rhyme to the music. That's what I pulled from the jazz guys, and that's what I'm coming from. How did you become the person you are? Are you sort of a media/pop-culture junkie? I don't read as much as I used to. I always liked school. But the hip-hop art form itself fueled my pursuit of knowledge. When you started working with radical musicians like Daddy Kev and Daedelus, did you feel it was time to break hip-hop's rigid rules? I've never come to that point. I'm just trying to do what I can do, and what I think sounds cool. There's a lot of generic stuff out there, homogenized. But people pretty much have their own approach if you leave 'em alone. I did a song on Alfred's first album on Plug Research, and that was cool. It was easygoing, intimate. It wasn't until we started making The Weather that it really got hard to deal with - but hard in a great way, 'cause a lot of music that Alfred does, a lot of those beats weren't thought of for any kind of lyricist or vocalist, they're just disjointed and all over the place. Me and Radioactive had to try to match it and keep it intact and somehow maneuver all around that. It's going from 4/4 to 6/8 to other things I couldn't even figure out; it didn't make any sense to me. But everybody was just doing what they were doing; it was a completely natural thing. Alfred gave us the music, we wrote lyrics to it, we did it and we left. Yeah, but where do the words come from? What are you trying to say? I write most of my stuff in the car. I'm mainly inspired by driving around L.A. and seeing how weird it is, contradictory. Where is hip-hop going, and what's it going to find when it gets there? It's an interesting craft, and I don't think there's enough credit given. There's a lot going on, and it's always downplayed as this kind of youth-culture crap - which it is, but it's coming from a very informed place. There are people who are into this not because it's rap or hip-hop, but because of the thickness of the thought, the thickness of the metaphor and the meaning.